The new SFP-25G-SR-S transceiver has been introduced by Cisco for Data Center and Enterprise applications. The new transceiver facilitates the migration from 10G to the 25G higher data rate by reducing the dollars per Gbps and enabling the reutilization of fiber infrastructure. 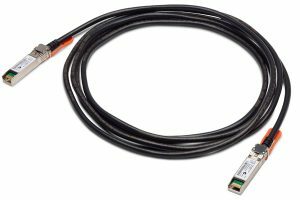 Cisco SFP28 to SFP28 copper direct-attach 25GBASE-CR1 cables are suitable for very short links and offer a highly cost-effective way to establish a 25-Gigabit link between SFP28 ports of Cisco switches within racks and across adjacent racks. Cisco offers passive copper cables in lengths of x=1, 2, 3, and 5 meters. 1m and 2m cables do not require FEC on the host port; 3m cables require BASE-R FEC on the host port; 5m cables require RS-FEC. Cisco SFP28 to SFP28 Active Optical Cables are direct-attach fiber assemblies with SFP connectors. They are suitable for very short distances and offer a cost-effective way to connect within racks and across adjacent racks. Cisco offers Active Optical Cables in lengths of 1, 2, 3, 5, 7, and 10 meters. AOC cable require BASE-R FEC on the host port. The Cisco 25GBASE-SR Module supports a link length of 70m on MMF (OM3) and up to 100m on MMF (OM4). This module requires RS-FEC on the host port. Because requirements and procedures for initial configurations and software upgrades tend to change, you should always refer to the switch or router software release notes for the latest information. Before installing, configuring, or upgrading a switch, refer to the product release notes on Cisco.com for the latest information. This compatibility matrix below does not replace or supersede the release notes. This publication lists the Cisco platforms and the minimum required software versions to support 25-Gigabit Ethernet transceiver modules. *Host side needs to support/enable at least FC-FEC.